Received: October 4, 2018; Revised: December 30, 2018; Accepted: December 30, 2018; Published online: January 31, 2019. We describe the creation of a percutaneous transhepatic bilioenteric neoanastomosis with the aid of cone-beam computed tomography (CBCT) in a patient suffering from a complicated bile leak after extensive hepatobiliary surgery. Access to the afferent bowel limb was safely performed in a single-stick manner via transhepatic approach with the aid of real-time navigation fluoroscopic imaging generated by CBCT arteriography. CBCT confirmed access of the afferent limb and absence of peri-anastomotic vessel damage, allowing the successful creation of a bilioenteric neoanastomosis, resolving the patient’s biliary leak. The patient is alive and asymptomatic at 12-month follow-up, demonstrating patency of the percutaneous bilioenteric neoanastomosis. Herein, we describe the creation of a percutaneous transhepatic bilioenteric neoanastomosis adjacent to the native surgical hepaticojejunostomy with the aid of cone-beam computed tomography (CBCT) for procedure planning and real-time imaging guidance on a patient with an aberrant isolated right posterior bile duct injury following extensive hepatobiliary surgery. All procedures performed in studies involving human participants were in accordance with the ethical standards of the institutional and/or national research committee and with the 1964 Helsinki declaration and its later amendments or comparable ethical standards. Informed consent was waived by our Institutional Review Board. This case report was compliant with the Health Insurance Portability and Accountability Act and approved by our institutional review board with a waiver of informed consent. A 19-year-old female patient with Von Hippel–Lindau syndrome, pancreatic neuroendocrine tumor metastatic to the liver and skip metastasis to the bile ducts underwent a left hepatectomy, pylorus-preserving pancreaticoduodenectomy, duodenojejunostomy, and hepaticojejunostomy. Immediate postoperative course was remarkable for biloma formation arising from the excluded right posterior bile ducts (Fig. 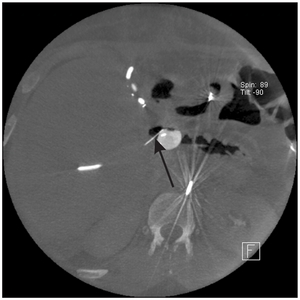 1), which was addressed with percutaneous abscess drain placement within the biloma and placement of a percutaneous transhepatic external biliary drain. After multidisciplinary discussion, the decision was made to attempt creation of a percutaneous bilioenteric neoanastomosis between the aberrant posterior bile duct and the afferent bowel limb. Under general anesthesia, two 0.035-inch guidewires were placed within the afferent bowel limb by endoscopy via the duo-denojejunostomy and were subsequently exchanged for a 5-Fr 100-cm long catheter (TEGT Torcon NB Advantage Beacon tip catheter; Cook Medical, Bloomington, IN, USA) and a 25-mm balloon catheter (Impact PTA balloon dilatation catheter; B. Braun, Bethlehem, PA, USA), which was inflated with a saline/contrast solution. The existing percutaneous external biliary drain was exchanged for a 6-Fr 23-cm-long sheath, and a 5-Fr Kumpe catheter (Cook Medical) was advanced through the sheath and placed with its tip adjacent to the external wall of the afferent bowel limb at the level of the balloon catheter. A 5-Fr catheter (SOS Omni Selective Catheter; Angiodynamics, Latham, NY, USA) was used to select the celiac artery. In order to evaluate the relationship between the hepatic artery, the afferent bowel limb, and the tip of the 5-Fr Kumpe catheter, a single-phase CBCT arteriography (CBCTA) was performed with an injection rate of 1.5 mL/second of 100% contrast medium (Ominipaque 300; GE Healthcare, Little Chalfont, UK) with a 5 seconds delay imaging acquisition (Fig. 2). Using an image guidance software package (syngo iGuide-Toolbox; Siemens AG, Forchheim, Germany), a virtual path between the 5-Fr Kumpe and the balloon catheter was drawn on the soft-tissue reconstructed multiplanar CBCTA images on a separate workstation (Leonardo; Siemens AG) with the intent of avoiding the anteriorly and cranially located hepatic artery. The virtual path was overlaid on the fluoroscopic images using a Cartesian coordinate system for real-time navigation (Fig. 2). The back tip of a 0.018-inch guide wire (V-18 control wire; Boston Scientific, Marlborough, MA, USA) was placed through the 5-Fr Kumpe catheter and used to penetrate the afferent bowel limb. A non-contrast CBCT was then performed demonstrating successful access to the afferent bowel limb (Fig. 3). 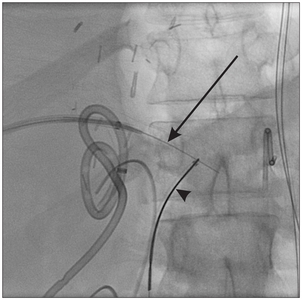 The existing 5-Fr catheter located within the afferent bowel limb was exchanged for a 25-mm snare kit (Amplatz GooseNeck Snare Kit; Covidien, Plymouth, MN, USA), which was used to capture the tip of the 0.018-inch percutaneous guide wire (Fig. 4). The 5-Fr Kumpe catheter was then advanced over the wire within the afferent limb lumen. The catheter was exchanged over a 0.035-inch guide wire for a 20 mm × 4 mm balloon catheter (Mustang PTA balloon dilatation catheter; Boston Scientific), which was used to dilate the afferent bowel limb wall. Finally, a 10.2-Fr external/internal drainage biliary catheter (Cook Medical) was advanced over the guide wire, revealing adequate drainage of the bile ducts within the afferent bowel limb and no evidence of contrast extravasation into the abdominal cavity (Fig. 5). The biliary catheter was capped 48 hours after the procedure. The patient had immediate decreased output from the percutaneous abscess drains, which were removed 3 days after the procedure. Routine cholangiography at 3 months showed a mature bilioenteric neo-anastomosis tract with no signs of stenosis or contrast leaking (Fig. 6). 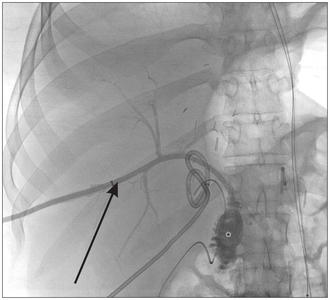 The patient is alive and remains asymptomatic with the percutaneous biliary catheter capped at 12-month follow-up. CBCT image fusion and navigation have been recently described to facilitate planning of technically challenging procedures where information provided by the combination of fluoroscopic and cross-sectional imaging is required.6–8 Wallace et al6 suggested that CBCT cholangiography could be especially useful in delineating variant biliary anatomy when surgical intervention is considered. Likewise, Nanashima et al9 postulated that the use of CBCT three-dimensional cholangiography provides better spatial resolution than two-dimensional cholangiography. In our case, identification of an aberrant excluded posterior bile duct by CBCT and associated bile leak was critical for planning and treatment. One of the most challenging aspects of creating a percutaneous bilioenteric neoanastomosis is completing the puncture from the biliary system to the afferent bowel limb in a precise and safe manner. In order to facilitate this step, we utilized CBCTA images to identify the hepatic artery and the posteriorly located portal vein, thereby providing useful information for planning a safe route for the percutaneous transhepatic puncture of the afferent loop by means of a virtual fluoroscopic path. This virtual path provided pertinent real-time information used to safely direct the catheter and guide wire toward the afferent bowel while avoiding peri-anastomotic vessels. Finally, CBCT obtained immediately after percutaneous access to the afferent limb also provided prompt confirmation of the technical success and the absence of inadvertent peri-anastomotic vessel puncture. In patients with hepaticojejunostomy dehiscence where percutaneous approach is considered the preferred treatment, a combined transhepatic and transjejunal access is routinely used as the method of choice.5,10 Percutaneous access to the small bowel is associated with significant rates of technical failure, complications, and post-procedure pain of 0% to 50%, 2.8% to 4.1%, and 100%, respectively.3,10–12 Furthermore, the creation of a percutaneous hepaticojejunostomy without proper identification of the peri-anastomotic vessels carries a risk of inadvertent arterial puncture and its associated complications. To reduce such risks, a minimal number of percutaneous punctures and clear depiction of peri-anastomotic vessels is critical. We were able to achieve such results with a single percutaneous transhepatic access without the need of a transjejunal access by using the information provided by CBCT images. The placement of a balloon catheter within the afferent bowel limb adjacent to the intended puncture site for the creation of a hepaticoneojejunostomy was first described by Kloeckner et al,13 who used a percutaneous transjejunal approach for its placement. This strategy facilitates identification of the afferent bowel limb and its intended target point for puncture access. In the case presented herein, we were able to place the balloon catheter within the afferent bowel limb, advancing it over an endoscopically placed guide wire, obviating the need for percutaneous transjejunal access and the associated risks. Although proper identification of the afferent bowel limb could be obtained on CBCT images without the need for placement of a balloon-catheter, we decided to proceed with this step in order to facilitate depiction of the afferent bowel limb and in order to assist in bringing the bowel limp close to the excluded bile duct, shortening the route necessary to penetrate the afferent bowel limb. In conclusion, CBCT facilitated the creation of a bilioenteric neoanastomosis by providing information useful for diagnosis, procedure planning, real-time navigation, and confirmation of technical success after obtaining percutaneous-transhepatic afferent bowel limb access, while avoiding peri-anastomotic complications and obviating the need for a percutaneous transjejunal approach. Fig. 1. (A) Sinogram through the surgical drain demonstrates communication (arrowhead) between the biloma and the intra-hepatic bile ducts without opacification of the hepaticojejunostomy nor the afferent bowel limb. Note absence of opacification of the anterior and left intra-hepatic bile ducts. (B) Cone-beam computed tomography cholangiogram confirming contrast only within the posterior hepatic bile ducts (arrow) and no contrast within the anterior hepatic sectors (asterisk). Fig. 2. (A) Fluoroscopic image with virtual planned path (white line) between the 5-Fr percutaneous catheter (arrow) and the balloon-catheter located within the afferent limb (“B”). Note the 2 percutaneous abscess drains (asterisks), the 5-Fr catheter TEGT catheter (Cook Medical) within the afferent limb (arrowhead) and the 5-Fr vascular catheter at the projection of the celiac artery (“C”). (B, C) Coronal and axial maximum intensity projection cone-beam computed tomography arteriography reconstructions depicting the virtual path (yellow dots) between the 5-Fr percutaneous catheter (arrows) and the balloon catheter (“B”) located within the afferent limb. Note hepatic artery (asterisks) located antero-superiorly to planned virtual path. Fig. 3. Cone-beam computed tomography showing successful guide wire access (arrow) to the afferent bowel limb. Fig. 4. Successful capture of the percutaneous microwire (arrow) by the snare kit (arrowhead). Fig. 5. Successful external/internal percutaneous biliary drain (arrows) placement demonstrating opacification of the afferent limb (asterisk). Fig. 6. 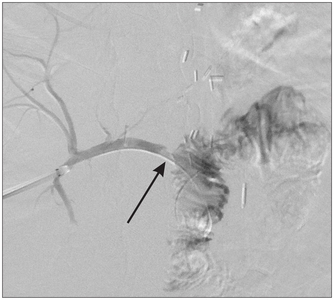 Three-month digital subtraction cholangiogram showing patent bilio-enteric neonastomosis (arrow) with no signs of contrast extravasation. Burkhart RA, Relles D, Pineda DM, Gabale S, Sauter PK, Rosato EL, et al. Defining treatment and outcomes of hepaticojejunostomy failure following pancreaticoduodenectomy. J Gastrointest Surg. 2013;17:451-60. Koch M, Garden OJ, Padbury R, Rahbari NN, Adam R, Capussotti L, et al. Bile leakage after hepatobiliary and pancreatic surgery: a definition and grading of severity by the International Study Group of Liver Surgery. Surgery. 2011;149:680-8. Mansueto G, Contro A, Zamboni GA, De Robertis R. Retrograde percutaneous transjejunal creation of biliary neoanastomoses in patients with complete hepaticojejunostomy dehiscence. J Vasc Interv Radiol. 2015;26:1544-9. Laffey KJ, Bixon R, Price JB, Martin EC. Percutaneous creation of a hepaticojejunostomy. Gastrointest Radiol. 1987;12:304-6. Lee SM, Kim HB, Lee IJ. Fluoroscopy-guided transgastric hepaticoantrostomy in a patient with bile leakage associated with biliary obstruction after left hepatic trisectionectomy. J Vasc Interv Radiol. 2015;26:1748-50. Wallace MJ, Kuo MD, Glaiberman C, Binkert CA, Orth RC, Soulez G; Technology Assessment Committee of the Society of Interventional Radiology. Three-dimensional C-arm cone-beam CT: applications in the interventional suite. J Vasc Interv Radiol. 2009;20(7 Suppl):S523-37. Tam A, Mohamed A, Pfister M, Rohm E, Wallace MJ. C-arm cone beam computed tomographic needle path overlay for fluoroscopic-guided placement of translumbar central venous catheters. Cardiovasc Intervent Radiol. 2009;32:820-4. Sze DY, Strobel N, Fahrig R, Moore T, Busque S, Frisoli JK. Transjugular intrahepatic portosystemic shunt creation in a polycystic liver facilitated by hybrid cross-sectional/angiographic imaging. J Vasc Interv Radiol. 2006;17:711-5. Nanashima A, Abo T, Sakamoto I, Makino K, Sumida Y, Sawai T, et al. Three-dimensional cholangiography applying C-arm computed tomography in bile duct carcinoma: a new radiological technique. Hepatogastroenterology. 2009;56:615-8. Fontein DB, Gibson RN, Collier NA, Tse GT, Wang LL, Speer TG, et al. Two decades of percutaneous transjejunal biliary intervention for benign biliary disease: a review of the intervention nature and complications. Insights Imaging. 2011;2:557-65. McPherson SJ, Gibson RN, Collier NA, Speer TG, Sherson ND. Percutaneous transjejunal biliary intervention: 10-year experience with access via Roux-en-Y loops. Radiology. 1998;206:665-72. Perry LJ, Stokes KR, Lewis WD, Jenkins RL, Clouse ME. Biliary intervention by means of percutaneous puncture of the antecolic jejunal loop. Radiology. 1995;195:163-7. Kloeckner R, Dueber C, dos Santos DP, Kara L, Pitton MB. Fluoroscopy-guided hepaticoneojejunostomy in recurrent anastomotic stricture after repeated surgical hepaticojejunostomy. J Vasc Interv Radiol. 2013;24:1750-2.